Geothermal is the most efficient heating and cooling technology and it has a variety of benefits. 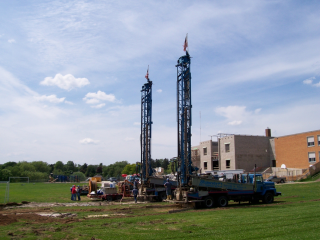 However, there a number of unique requirements in regards to the feasibility assessment of large geothermal systems that may create pitfalls for prospective system owners that are new to geothermal. This project was initiated to help prospective system owners navigate the feasibility assessment process, starting with the short-listing of candidate buildings and then moving on to pre-feasibility and feasibility assessments. While the focus is primarily retrofits, many considerations are also applicable to new builds. The guidance is based on a review of actual feasibility studies and consultation with industry experts and stakeholders, including the Toronto Renewable Energy Office, Geo-Xergy, GEOptimize & the GreyEdge Group, and a number of other industry stakeholders consulted in previous STEP projects.